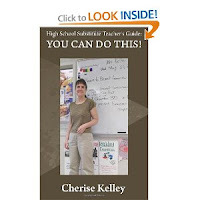 Sasha Jackson Mysteries : What Does Cherise Kelley Write??? What do dog aliens, substitute teachers, and wanna-be brides have in common? Besides Cherise Kelley as their book's author, I mean. Please tell me! Pretty please? I need a short snappy answer when colleagues ask, "So, what do you write?" 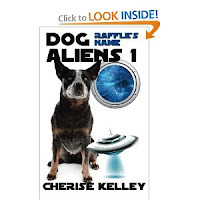 Dog Aliens is my series for dog lovers. My two dogs inspired it. We adopted them from the animal shelter, and they are both mixed breed, but they are the smartest dogs I ever met. Raffle uses his intelligence to make his humans happy by anticipating our every whim and being obedient. Oreo uses his smarts for evil! He delights in eating Raffle's food. When we first got him, he ran away all the time and chewed things he shouldn't. In the books, both dogs are from the planet Kax, but only Raffle knows this at first. Raffle communes with the Kaxians. Oreo thinks Raffle is nuts. was nice enough to explain to me how to get this job when I needed it, and I want today's unemployed college graduates to know they could be working! Many are intimidated by teaching, let alone teaching high school. My book tells not only how to get the job, but how to keep it and love it. Mixed in are lots of anecdotes. I made many mistakes when I first started out. At the time, they were devastating, but now they make great stories! The last chapter, Don't Be a Bad Example, tells of many bad teachers I have worked with or known of, throughout the years. together. I interviewed 50 married women to see what they had to do to get their men to commit to marriage. This is a controversial book. Some people think I am advocating manipulation. Others say I shouldn't tell women they have to be married. One reviewer got it just right. She says if you want marriage, then you shouldn't settle for just living together. That's really the message I want to send. The first 25 people to post reviews of any one of my books on Amazon get free paperbacks! Buy the Kindle book for a significant discount, review it, and get a free paperback! PM me on Goodreads with your mailing address once your review is up at Amazon! I also have a weight loss blog... I know! I am all over the place with my writing topics! Anyway, I lost 90 pounds in ten months. Every day, I blogged what I ate and what exercise I did. Today, this blog is about keeping the weight off. Right now, I am 10 pounds over. I've been struggling to drop these ten pounds since Christmas! OK, and yeah, I also write articles for Yahoo!